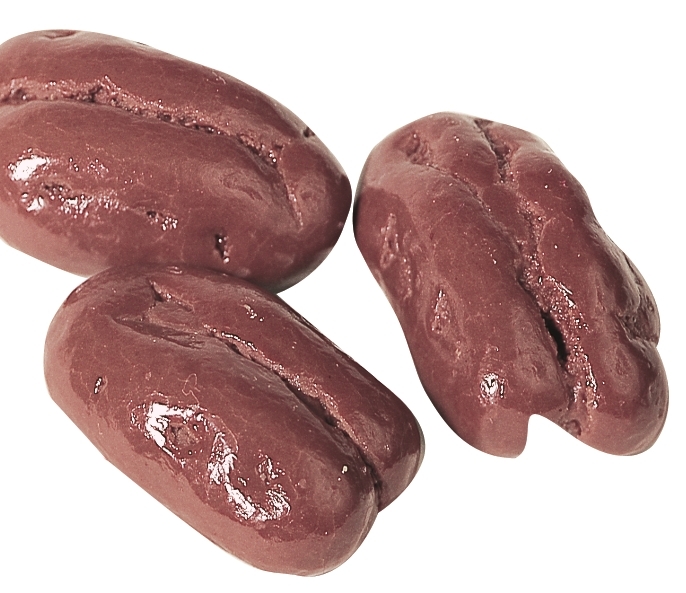 chocolate peanuts, chocolate almonds, choocolate raisins, chocolate Brazil nuts, chocolate cashews, chocolate pecans, chocolate malt balls, chocolate hazelnuts, chocolate mixed nuts, and many other richly covered nut and fruit covered products like gummy bears, cinnamon bears, spice drops, etc. These freshly roasted nut are placed in a turning drum called a "pan". 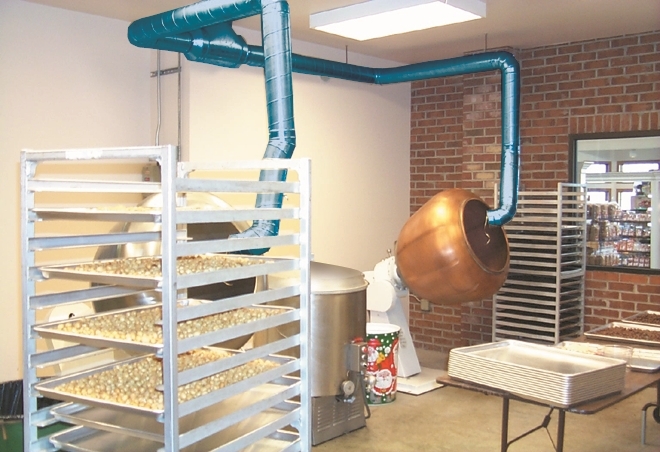 A typical batch starts with around 50-75 pounds of freshly roasted nuts. The drum is rotated at a fixed rotation of around 30 rotations a minute. As the drum rotates, a very special chocolate pump adds about a pound of chocolate every time it pumps. The drum is rotating and the nuts are tumbling. The chocolate is encasing the nut centers. The 100 degree hot chocolate is being cooled to a 60 degree temperture to make the chocolate set. 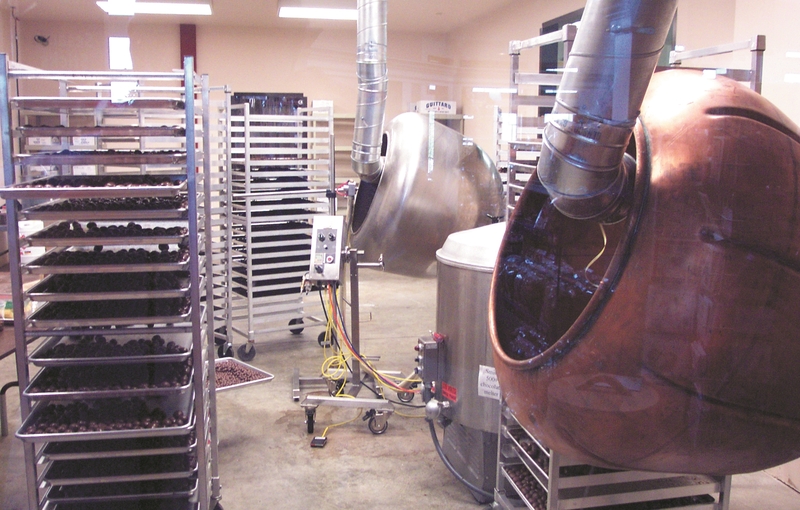 After about 150 to 200 layers of of chocolate are added - the product is now fully evenly surrounded with pure, rich chocolate. 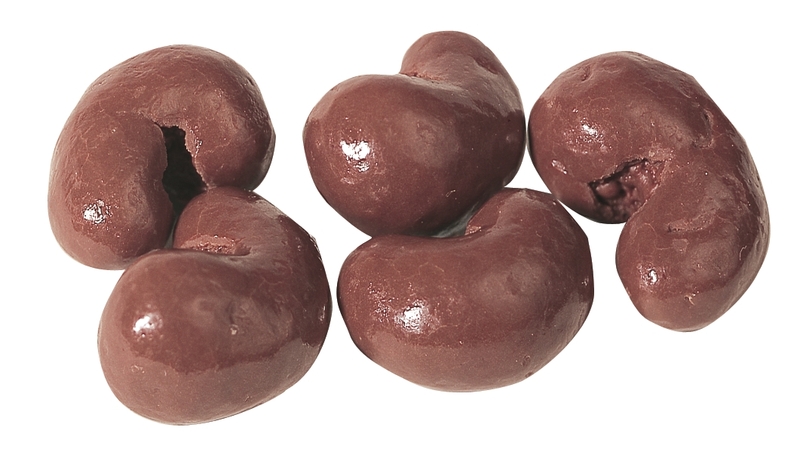 The chocolated nuts are taken to a ribbed finishing drum to be shined to a glossy level. Panning is an art form using expensive equipment. There are not many people who have panning experience and this chocolating method is not easily learned. We have excellent and long experience panning the most wonderful and incredibly tasteful nut items to ship to our many customers.